Malware is ubiquitous these days, earlier it only affected PCs, but today with the proliferation of smartphones and tablets malware authors are targeting smartphones, tablets, windows PCs and what not. We daily come across some malware or adware affecting users, so it has become a habit for Windows users to have an Antivirus software running in the system. But when it comes to smartphones most of us don’t have an antivirus solution. As we slowly moving from PCs to mobile devices for most of the computing purposes it is only wise to have a security solution in smartphones as well. There are all kinds of malicious software including viruses, trojans, malware, adware, exploits targeting smartphones, particularly Android running mobile phones. Android being open source and popular attracts most attention from the bad guys. There are several antivirus apps available in the Google Play store for protecting your Android phone from unwanted malicious software that is constantly pumped into the devices by whatever means possible. While there are both free and paid versions of the apps in the play store for securing your android device, we will see the best free solutions today. Sometimes premium software will have more features and may advertise as a better security product, but this is not always the case, and there are some really nice security applications that are free. 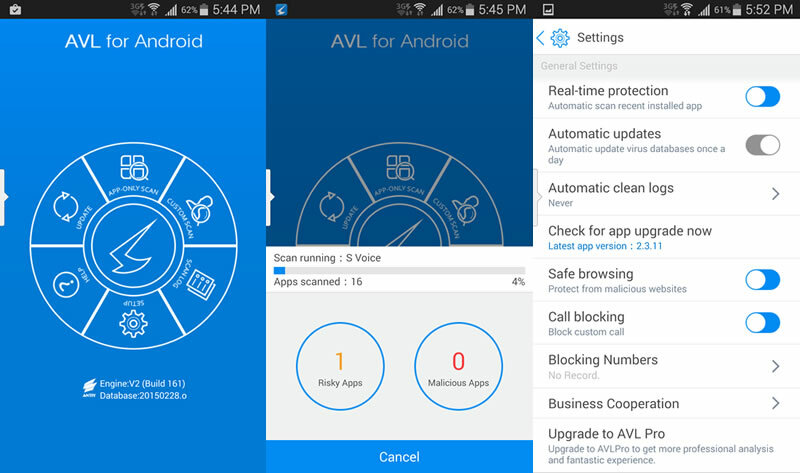 If you don’t know where to look for the best antivirus app for android, head over to Av-test.org site, it is an independent site and ranks antivirus products based on merits. The rankings will change every 2 months but you can get a fair list of apps that are best of the lot. Here are some of the free android antivirus apps that can be downloaded for your android mobile. These apps are best of the lot and arranged in no order of preference. AVL: This app is one of the most popular app in Android market. The app offers comprehensive security features, offers real time protection, call blocking etc. This is a free app and sufficient for most of the users. If you want more control and extra features you can buy a pro version of the app. After downloading the app, you can straight away run the scan to see if there are any malicious apps in your mobile. It shows the risky apps, and malicious apps. Be careful with the risky apps, as these apps can be false positives. 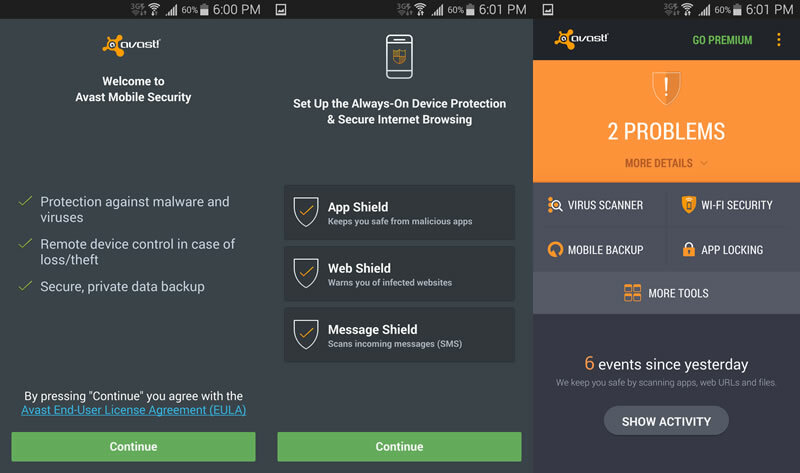 Avast Mobile Security & Antivirus: Most of us know Avast, it is also available for Windows PCs from longtime and it is one of the best antivirus app for Android. 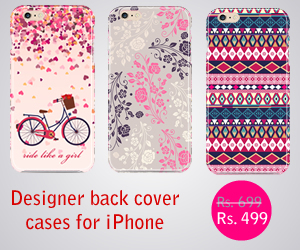 It offers antivirus and anti-theft protection for your mobile phone. Antivirus scanner scans installed apps, memory card content, apps on first usage, users can also schedule scans. Call blocking and filters, web shield for protecting against web threats. It also Firewall for devices that are rooted. Offers basic backup feature for SMS, Contacts etc, if you need extra features you can buy the premium version of the app that can backup music videos, unlimited app locks etc. 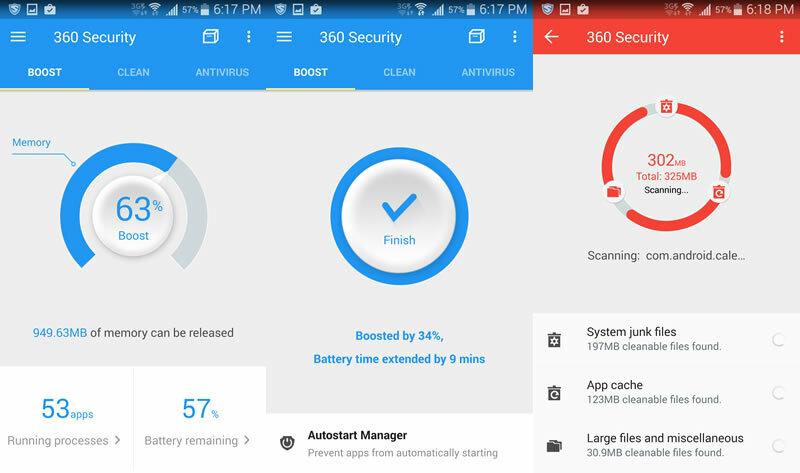 360 Security & Antivirus: 360 security offers several features and it is one of the best apps for an android phone. The list of features include virus scanning, memory boost, where it can free up the memory by closing unnecessary processes. Clean junk files and app caches to free up storage space and to boost android performance. The App Manager feature allows you to manage your apps, you can remove apps you don’t need anymore, move apps between storage and SD card. It also includes an Anti Theft solution, the features include Erase, Locate, Lock and Alarm. Offers real time protection as well. AVG AntiVirus Security: Most of us know AVG Anti Virus back from our Windows machines. 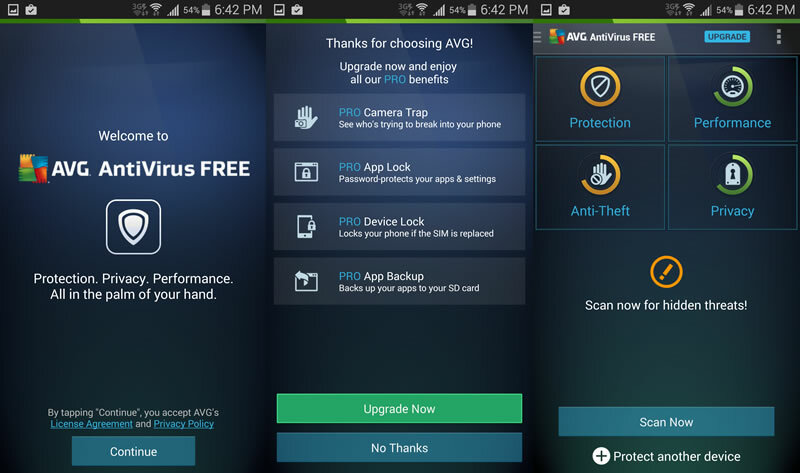 AVG offers both antivirus and security for your android mobile phones. The app offers scanning for threats like malware, adware, malicious apps etc. It also offers anti-theft functionality. Some of the features like App lock and App backups are premium but overall offers a basic antivirus and security features for your Android smartphone. 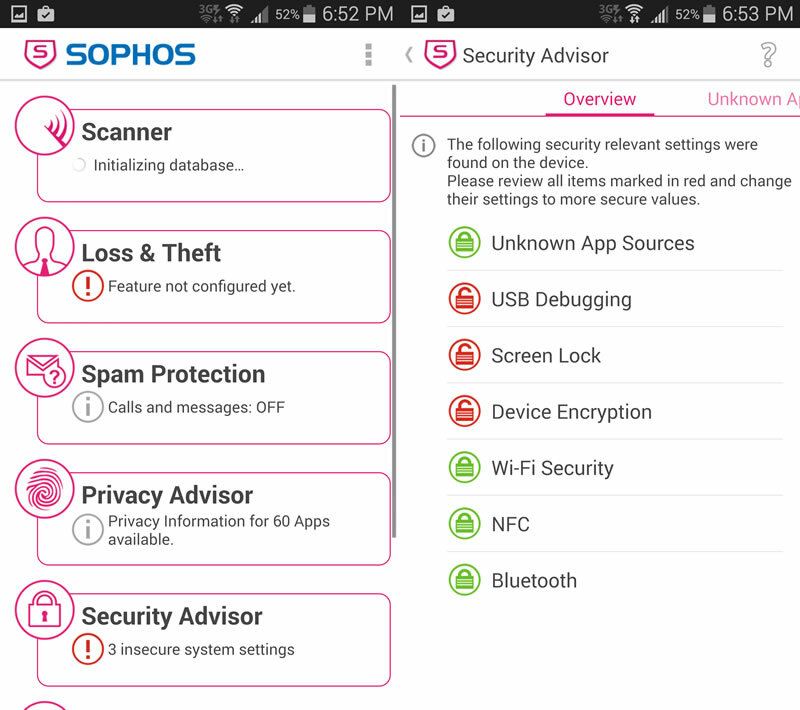 Sophos Antivirus & Security: Sophos Antivirus and Security app protects your mobile phone from malicious software, It has all the features needed in a mobile antivirus app. Offers anti-theft feature, call blocking and other filters. Web protection block malicious sites and offers parental controls. While a good antivirus is required in today’s world, but the antivirus alone can’t protect you from online threats. You should be careful as well, common sense will take you long way in terms of security. Things to remember is not to load apps from third party sites, if you have to do that anytime check the web for known threats, scams and the legitimacy of the app before downloading to your mobile. Unless it is necessary do not side load the apps. When downloading apps from the app store look for its popularity ratings, if the app has poor ratings check what the reviewers are saying about it. If we have missed your favorite app, let us know and tell us why it is best.